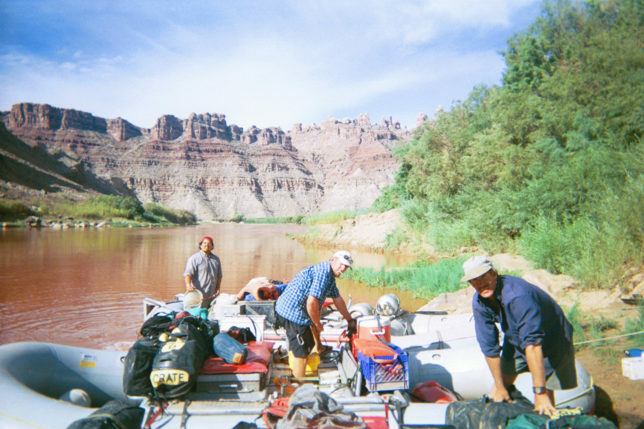 I took this photo in September of 2002 during a fall Colorado River & Trail Expeditions’ Canyonlands Hiking trip. The trips guides were John Toner, myself(Walker Mackay), Chris Parks, and Kimo Nelson. We had just finished a layover day at Upper Spanish Bottom and were rigging the boats in the pleasant early September morning sun. The previous day the guides and guests had hiked deep into the Doll’s House of the the Maze District of Canyonlands National Park. I recall the trip was 7 days in length and this would have been the morning of day 5. 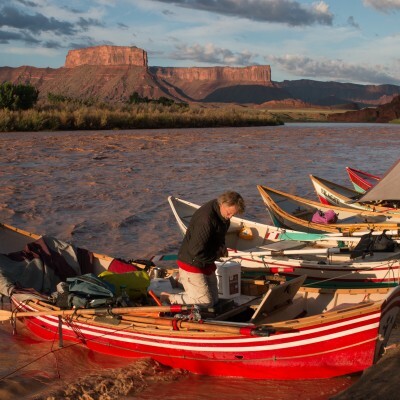 The trip had started at Potash and followed the Colorado River through Meander Canyon. The Colorado River had been really low, but monsoons had raised the level of the river and turned the Colorado River its namesake color. The flow for the rapids was right around 4500 cfs. We were using our Havasu III rafts that were bucket boats. This was before we took cots or chairs on river trips. Posted November 16, 2017 by Crate Inc.